Sharpening particles of natural stones are uneven in their sizes and the resulting edge's "teeth" will also be uneven, making a knife stay sharper for a longer time as the "teeth' will dull unevenly Natural stones dish at a much slower rate then synthetic, so a natural stone will last longer then a synthetic one and doesn't need to be flattened often. A good size natural stone will last a life-time Natural stones remove burr easier than synthetic stones, hence a knife gets much sharper and holds sharpness for much longer Natural stones will create a hazy kasumi finish I work as chef and use my knifes a lot and I can feel a difference in performance when a knife is sharpened on natural or synthetic stones. In general, softer natural stones are more useful for kitchen knives and are easier to use than harder stones, so it is best to start with softer stones and get harder stones as your skills improve. Some very hard and fine stone can scratch soft iron (jigane) but not hard steel (hagane), that is not because stone is bad but cause steel is softer then stone it self. So you have to use them with care and use these stones only with slurry and light pressure. This hard and fine stone usually the most rare and expensive stones. These stones are very good for tools and razors. I will not talk much here about stones from rare mines and stratas, as I think most important is to get a stone that works best on your knife or razor, and it might not matter as much which mine and strata it comes from. However, for clarification purpose, all stones on the website will include a name of the mine (i.e. Ohira), a strata the stone was mined from (i.e. Tomae), an appearance (i.e. Asagi), and a hardness level (Lv 3). A cutting ability of a stone will also be noted. 5. Shinden Suita Renge Lv 3.5 Stratas From soft on top and very hard on the button. I have been dealing in Japanese natural sharpening stones for some time now, and through my experiences with both wholesalers and customers I have realized that there are quite a few misunderstandings about these fabulous antiquities. I think many have a tendency to look at Japanese polishing stones from only one perspective instead of seeing every stone as entirely unique; each with its own multifaceted set of qualities. I have seen the claim on numerous occasions that only “old” or “rare” stones are worth buying because only they possess the best sharpening qualities. This false claim is usually conjoined with the idea that “new stock” stones are of a lower overall quality than previously sold stones. To clarify, the geological time scale does not work on the same time frame that we consider “old and young”. 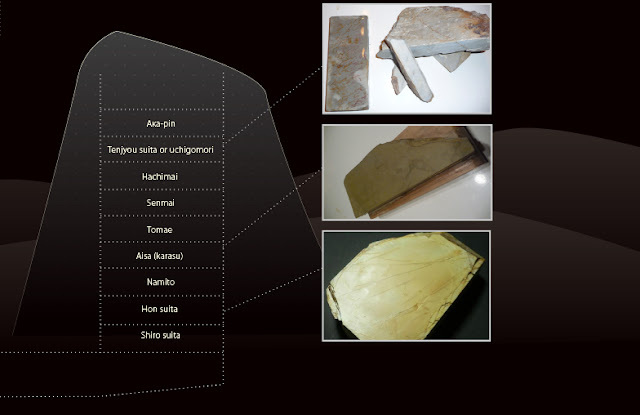 To add some perspective, all Japanese natural sharpening stones were formed during a period of about 500 million years, so it seems unlikely that there is a huge difference between a stone mined 100 years ago and one mined 60 years ago. In fact, most mines were closed 60-70 years ago, and the current stock of stones bearing their kanji comes from raw material excavated before the mine closure and stored for later use. So in reality, not much quality difference exists between stones stamped 60 years ago or stamped today, only the methods in which they are cut and flattened. The only quarry still being actively excavated is the Marouyama mine but also very rarely Ohira. This is important as some vendors are spreading misinformation that older stones are of higher quality in order to fetch higher prices for their stock. With the above in mind, I would like to share some information in hopes of explaining how the stone business in Japan operates. All sales in Japan are now done by a few wholesalers: Tanaka, Imanishi, HaTanaka, Asano and ,a few others. All current wholesalers have huge amounts of old stock raw material: Ohira, Ozuku, Nakayama, Shobudani, Okudo etc. This is not to say that stones from any two wholesalers will be the same, far from it. All “in stock” stones at every wholesaler will have a variety of qualities that make them unique, such as varying strata, hardness, fineness, and color combinations (red, yellow, gray, green and etc). But these unique attributes do not depend on when they were chiseled as raw material from the mine, but instead depend more so on the person who selected the original raw material, and current market demand for certain stones. Demand for certain types of stones (ie. Kiita or Light Suita) dictates which of the raw material will be processed first. In Japan, the highest demand for stones comes from local carpenters and sword polishers, not from knife or razor users. In fact, the number of people in Japan that buy and use natural stones for razors and knives is less than 1% of the total market share. Razor quality stones are very hard and fine, and often not useable for knives or tools because they scratch the soft steel cladding and are very slow. These types of stones are of little use to busy carpenters or chefs (i.e. 99% of the market share), whose tools need to be maintained with as little work as possible. Because of this, very hard and fine stones are not highly sought after, and due to their low overall demand in comparison are actually considered less valuable. This, however, does not mean that they are bad, far from it. Iwasaki San and other razor smiths have personally conveyed their preference for very hard Nakayama or Ozuku. A recent tendency among carpenters is to use super hard Asagis for Ura side of their tools. In the past carpenters were way too busy and they had to sharpen their tools on building sight so they needed super fast stones that could bring back their tools sharpness within minutes and they did not want to carry 5 or 6 stones, that would have been way too heavy and cumbersome. So they needed stones fast and fine at the same time. Thats why they preferred Suitas for tools, not finest Suitas just middle fineness and they did not care much about inclusions or lines and those stones are now very hard to get as they are all bought up. One can get much better result with Very fine Nakayama or super hard Ozuku but it just takes more time. For sword polishing the most sought after stones are Asano Koma Nagura and Uchigomori stones. Uchigomori come only from Ohira and Mizukihara mine, those stones are only between 3000 and 5000 grit, not more. They are known for their super soft particles that will not scratch Tamahagane steel. They are not as fine as some think, Tamahagane is quite soft steel and it can not handle to fine polish, it will also get scratched when harder stones are used. Uchigumori are also very slow stones, they are not used for sharpening, as many think, they are only used for polishing and to bring contrast between hardened steel clouds and the hamon. Asano Naguras are mostly used by carpenters and sword polishers, and thats is why there is so little supply of them right now. Koma is especially scarce because it is fastest but also very fine. Another factor for high price of Koma nagura is that Koma supply of raw rock that yields quality stones is almost depleted. There are many sellers that sell naguras that are not Asano certified and of inconsistent quality. Only Asano stamped naguras are certified for quality and authenticity. A few words about the different wholesalers. That is why you see sometimes huge price difference between stones of similar quality. The color of the stone is not the only determining factor of the sale prices, for instance if many sellers start to ask a lot for a Ozuku asagi then Ozuku asagi price will increase a lot from that wholeseller, in general Nakayama are most sought after stones in Japan. Because of the high demand price for those stones have gone up considerably in the past year. Right now Nakayama Kiita and Suita stones are selling for extremely high prices, this also leads to a lot of stones from other origin being sold as Nakayama. We are aware of some vendors in US that are seling Ohira stones misrepresented for Nakayama, asking premium prices based on name recognition alone. Some sellers will claim that they can tell the stones mine of origin by its skin or its looks, this is plain rubbish so be aware. I have asked numerous stone experts in Japan if its even possible and all of them agreed that its very hard to tell stones origins from the skin. There are very very few experts in Japan that can guess what stone is what and that is only done by testing the particular stone.